Galvalume Plus™ is an aluminum-zinc coated steel that provides extra corrosion protection. The cost of Galvalume Plus is about the same as that of galvanized steel. 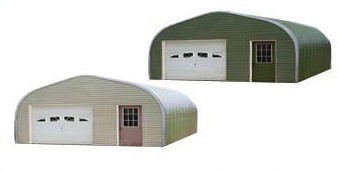 Currently, uses for Galvalume Plus include car mufflers, standing seam roofing, tubing for fences, greenhouses, steel buildings and much more. Produced for Pioneer Steel by the steel mill (ArcelorMittal Dofasco), Galvalume Plus offers excellent cost-effectiveness, which we pass on to our customers. Galvalume Plus™, by virtue of its combined protection of aluminum and zinc, has at least twice the service life, in most atmospheric environments, of conventional galvanized steel with the same coating thickness. Galvalume Plus™ steel resists intermediate and high temperatures far more effectively than galvanized steel. Specifically, Galvalume Plus steel shows no discoloration up to 315°C (600°F) during continuous or intermittent exposure over a prolonged period. 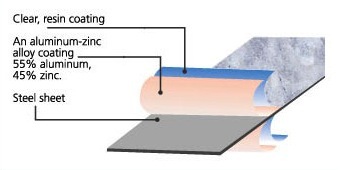 Above this temperature, some discoloration does occur and roughening of the surface is possible. Neither this discoloration nor roughening, however, reduces Galvalume Plus's resistance to rust. Galvalume Plus maintains its rust-resistance up to 675°C (1250°F) . Additionally, Galvalume Plus has excellent heat reflectivity, up to operating temperatures of about 315°C (600°F) . This heat reflectivity makes a building cooler inside on hot, sunny days. 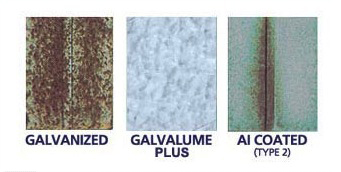 Galvalume Plus readily accepts most of the paints recommended for galvanized steel. 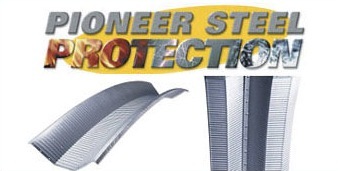 The surface should be dry and free of oil, grease, dirt, dust and other contaminants. No weathering period is necessary. The following suggestions of paint types should be used only as a guideline. Specific paints and recommendations should be discussed with paint suppliers. A paint supplier should be consulted to select the most appropriate painting system and to ensure compatibility of primer and topcoat. Have other questions about Galvalume Plus? Check out our FAQ section.